As I reflect this year, I realize that ” The quest to Define Self must proceed, self determination but Kujichagulia, Self definition is not necessarily self determination”. Self Determination requires thinking through the consequences and making a choice what is in ones best interest! It means getting facts and weighing consequences! It means READING; It means LISTENING; It means DEBATE BEFORE ONE CAN DETERMINE based on ones self defined values! The 2009 post- I am often asked what you are… usually it is in reference to my professional definition, Sometimes it is in reference to my dialect! I had Individuals tell me I don’t look “Trini”, I’ve had some say that my designs were not black… Others are quick to define you, if you let them! To define your business, name your business, create for ourselves, and speak for ourselves! Few adults can do this… our culture has taught us to have absolute control over our children, and sometimes it’s difficult to know when or how to help them become the best adults they can be! How & when to allow them to define themselves. Define your business; how are we supposed to learn to define something of this magnitude if we do not feel entitled to define our style of clothing! Their definition may not be in our taste! The challenge as a parent is deciding what decisions to hand over to them when and more importantly how to raise them to define for themselves! Many young college students enter college without ever having to define a budget for food, clothing and shelter! Too often we leave college with moms and pops having taken up the slack for our entire college life and thus, we are adults unable to determine our own spending habits! Economically it is not easy to let teenage make mistakes with the food budget! More importantly letting go of control and allowing them the make choices based on their thinking process is difficult! My 17 old son can now budget and shop… surprisingly he has learned to use coupons, and read labels for value! and weekly special something I honestly did not set out to teach him and truthfully there are days I still try to lay down every decision! This lack of entitlement or discomfort with it reflects many areas including our in our use of technology! We either go too far, saying and doing as we please regardless of consequences, or not far enough; not speaking up commenting and having our voices heard! Self determination is a skill formed over time! As I thought on what self determination meant as far as “creating for self” and “naming our business”; My mind went back to the projects during the latter half of this year FashionCamp, and the workshops with Black Media Professionals! What we do not know is preventing us from making effective decisions! In the last few years changes have been so rapid that unless we make it our business to stay current we run the risk of really missing the boat on these two! A few years ago there was no twitter, no such job as content creator! Someone asked me why were there are so many nurses, nurses aides and baby sitters in our community. Most of these hate their jobs yet it’s the only professional choice they were exposed to! 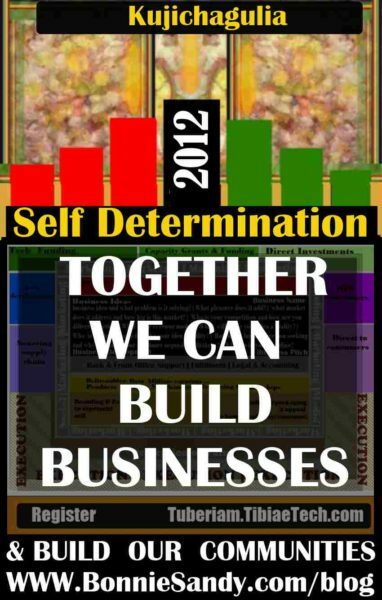 Self determination requires constant research and education and refining of knowledge! A few days ago I received an email announcing the TED2010 speaker line-up among the intros and how people defined themselves, One presenter has just fascinated me:– Michael Schemer skeptic! Michael Schermer.com skeptic.com here is a man who dared to define his own profession! Apparently he’s not alone… yes, there are other “skeptics”! One of my mentees recently asked me, how would she define her job description! When you create your own you can define your own job description! What pain can you solve, what pleasure can you give! I have been thinking about that this year when asked I’ll say I’m a Badasse! It will be the ultimate test self determination! Yes I’m influence by distance childhood references to Pam Grier, to a young girl growing up in the 70’s she was referred to with a certain, hushed reference , she was a BAD girl that did “right”. Simply put she was a trail blazer! B.A.D.A.S.S.E really is an acronym on a project of giving voice around the issues that surround Black, women and/or business as it relates to creativity! It took a while to claim but I have been an advocate since my late teens! I’ve tried to walk away but it is my calling! I am not quite a fashion designer, I am much more than a project manager, sure I’m an early adaptor, but I’m not really a geek! So what am I, I am a Badasse… at the least it will start a conversation! Self Determination gives you poetic license! I recently saw a discussion where someone was in a quandary, apparently his facebook account was deleted what and if like most people he has moved his entire contact list to this platform, and subsequently built the rest of his list on facebook! I fully understand his dilemma! Organizing my contacts is core to my definition of self determination! It is the sole reason I’m moving my contact list, My lists, my contacts are mine and I should be free to move it whenever possible! At the same time my contacts have a right to determine what info I have access to of theirs and what they receive from me! I encourage people to unsubscribe and will be sending them an invite to update their profile ! Self Determination demands that we take responsibility for the control over our information! Which leaves me perusing “speak for ourselves”? Communication is especially important, and media in all its present manifestations and forms are important! Too often we are afraid of censorship and cower behind silence! This year for example the issue of “black” designers were hot topics, Yet most who wrote on it were whites or writers with no reference to the authentic experiences of designers of African descent! We did not speak for ourselves… sure we have huge conversations huddled together at events, around menus at lounges , or in each others store… yes contrary to popular believe we actually like, admire and support each other and know each other! But to find designers with active collections addressing the topics! Where are the “REAL” Black designers! Maybe they have simply given up or are so busy focusing on surviving that they cannot deal with how or who speaks for them! If there is no other area that defines our freedom is the ability to speak for ourselves! As a young girl in Trinidad I discovered African fashions in one the patterns books and fell in love I had an aunt the girlfriend of my “Rasta” Uncle who wore her “fro” and wore was proudly natural! “I’m Black and I’m proud! Was an image I saw from an early age! We affect others when we give voice! As such as an adult and more importantly as a designer I never had issues of identity! The importance of young girls seeing themselves in the media cannot be overlooked! There are many who claim that the web is devoid of racism… really! I will give you a list of fashion sites. They do not reflect the America I know! I was once told that Brooklyn Fashion Gallery was too ethnic and as such designers and the problem will have issues with it! My answer, “If the color of the model will affect your choice, you are not my customer!” I can say this because I determine my platform! I am not dependent on anyone… if we do not have media, press; televisions programs where we can self determine we will be lost!